Colors: Teal and Cream. Ptolemaians wear a teal tie. Specializations of Magic: Sympathetic magic, psychometry, abjuration, channeling, astral projection, clairvoyance, ecological empathy, summoning, evocation, magical energy manipulation, transitions, spirit-communication, shamanic rites. Ptolemy Court’s motto is First and Farthest, and its students take those words seriously. To be first usually means that they try to find the most ancient precedent possible for their magical practices: they want to be connected to the first person ever to have created a spell, or to have used a particular divination technique. You can find Ptolemy students in the library late at night, trying to trace their spells and rituals back through history. Less often, it means that Ptolemy students will innovate, trying to become the first to create a new ritual, spell, or practice. This is always a risky proposition at the tradition-bound Imperial Magischola: not everyone wants to innovate or accept the notoriety or consequences for doing so. There is a certain tension within Ptolemy Court, therefore, between those who wish to be the first, and those who wish to follow the example of whoever was first. Some Ptolemy students are bold to the point of recklessness, striving to innovate and excel; others meticulously sift through every omen and consider every possibility before finally taking action. Most agree that they want to be first in their respective classes by taking top marks. Some enthusiastic Ptolemy students, especially first-years, take being “first” more literally: they run races to get to the dining hall first, or they call “First!” when they proudly offer the first comment in a class discussion. Such practices are generally held to be undignified, but more Ptolemy students enjoy these competitions than would admit to it openly. Professors are divided in how they feel about the practice: some reward Court Points for justifiable expressions of accomplishment; others deduct points for the obnoxiousness of shouting out in class. Such emphasis on precedent and being first can lead to danger, too. One student’s name is forever lost to posterity because he erased himself in the course of his thesis research in 1952; only scattered notes enabled his advisor to surmise that the student had indeed existed at all, and that he had traveled back in time to plant documents to establish a precedent for his thesis project. Time magic is of course forbidden, but it still tempts many Ptolemy students – for instance, divination specialists occasionally travel forward to test the accuracy of their predictions. This relative comfort with time magic draws many students from Magnolia Sun, who are used to living in an area of temporal instability. More conventional astromancy techniques can also be turned towards less ethical purposes as well. Some Ptolemy students have grown rich from their sudden surprising good luck at gambling. Only a few have ever been proven to have used divination to cheat the odds, but it’s an open secret that it happens. Ptolemy Court honors the legacy of its namesake in many ways, both practical and philosophical. Court members keep records of the birthdays and horoscopes of all Ptolemy students, and the Court celebrates students’ birthdays with great diligence and unusual solemnity. This is not to say that all Ptolemy students are serious in all things — in fact, another tension within the Court is between those who take life rather seriously, and those who are mindful of their dolphin mascot and prefer a more playful attitude. They also follow their mascot (and namesake as well) in valuing music. Ptolemy Court’s open mic nights are renowned for the quality of their performances, and their annual Battle of the Bands competition brings a full weekend of music to the shores of the lake. When Ptolemy students pair off in a romance, they compare horoscopes — as their namesake advised — to determine the degree of harmony between the patterns. Some Ptolemy students are even more proactive in this practice, comparing their friends’ horoscopes to see who would be the most auspicious match. Court members are often consulted for advice on the success of relationships, experiments, business endeavors, events, and pranks. A Ptolemy Court student will always ask your magic number, and if you don’t know, they will stop, ask for your time and place of birth, and calculate your magic number for you there on the spot. Such information is vitally important, they say – although it is never clear for whom it is important, them or you. Ptolemaians have equally lengthy debates about the nature of fate, with equally divided results. Some believe that a person’s fate is fixed: it is determined by their horoscope at the time of their birth, and the astromancer’s job is simply to discover the fate that already exists. Others believe that each person’s fate is constantly shifting due to their choices and their interactions with others; to them, the astromancer must try to discern a person’s fate as best they can at that given moment, but must also understand that that fate will always change. Still others believe that fate itself is out of reach: humans can only rarely discern or understand it, and what an astromancer divines is only an approximation. Another legacy of the historical Ptolemy is the Court’s emphasis on number-based magical techniques: not only the kinds of mathematical analysis that the great scholar himself practiced in his mapping of the stars but also the study of numerology and the mystical numerical correspondences of various runic alphabets. More recently, technomagic researchers (an Imperial rarity) have combined mundane cryptographic computer programs with classical divination practices to calculate magical and secret numbers on a scale that was barely conceivable to previous generations. The Edict of Separation and Secrecy, of course, prohibits them from entering or interfering with mundane lotteries and private forms of gambling. Ptolemy Court also follows the example of mystics such as Dante, Joan of Arc, and Julian of Norwich. Some Ptolemy students seek visions of the future; some try to see faraway places on this plane or others; some attempt to read or manipulate auras and emotions, helping to soothe and repair, or, in the rare case of a malicious Ptolemy student, to harm. Others pursue visions more concrete and mundane: a few have done a brisk business in clairvoyant investigations, seeking out lost property, catching petty thieves, and spying on classmates as well. The contributions of Ptolemy graduates in the field of scrying-mirror artificiery, as well as the development of other divination devices, led to major advances in the Catoptrics network. Some Ptolemy graduates excel as magi-economists on the Millikens Market, using arithmancy and numerological concatenations to analyze and predict business trends and investments. The farthest part of the Ptolemy motto means that they trace their magical traditions back through generations of European wizards who used the stars to travel throughout this world and others. They follow the example of Egeria, who created roads from France to the Middle East; Brendan the Navigator, who sailed from Ireland to Newfoundland via the Otherworld in the seventh century; and Leif Eriksson and the other Norse wizards whose understanding of the magical properties of sunstones allowed them to navigate far across the ocean. 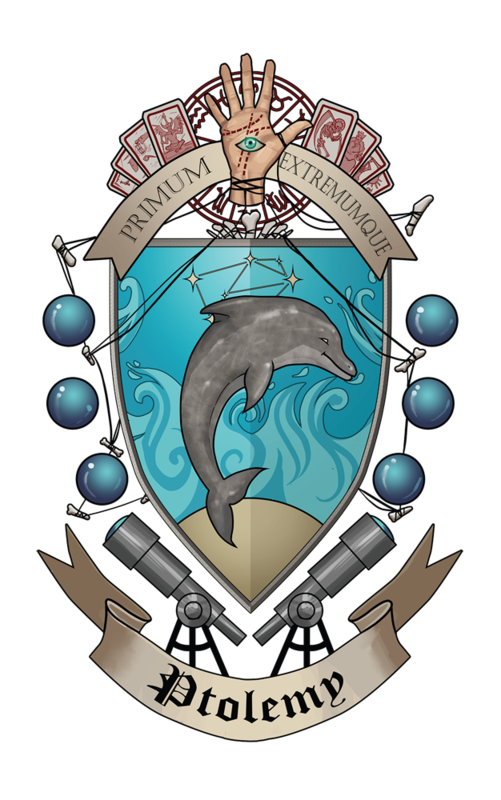 This legacy gives students from Virginia Isle a particular affinity for Ptolemy Court; they are steeped in the lore of celestial navigation, and are comfortable with the idea of traveling above the rest of the Magimundi lands. Ptolemy students also love to explore the campus. They take pride in claiming the highest spot on campus – first and farthest, again — the stargazing tower commissioned by Thomas Woodhouse himself. There are rumors of collections of maps hidden in the Ptolemy Court common room that detail all of the secret places on campus. Whether or not that is true, it is certain that Ptolemy students will always help a fellow Court member find their way: literally, by helping them when they are lost; and metaphorically, by coming to each others’ aid when they are in need of advice about how to make a decision. In this, they also emulate their dolphin mascot — dolphins always come to the aid of a troubled podmate, and often lead ships and sailors to safety as well. K. Barr, professor of divination, who in 1783 predicted that in 2051, Virginia Isle would fly all the way to Europe. They became a ghost so that they can stay around to see if their prediction will come true. Demian Delaroche: he is the current Principal of Magnolia Sun. Marcus Locklear: in 1853, he predicted the Vampire Wars. Carmen Ciro: they were a Baja alcalde, celebrated for their speed and skill in navigating the difficult desert terrain. Ptolemy of Alexandria, c. 100-c. 170 CE. Foundational scholar in the European study of arithmancy, divination, and astronomy. Ptolemy was born in southern Egypt (perhaps as far south as what is now Sudan). He spent most of his career in Alexandria, home of the famous library and center of the most sophisticated magical and mundane scholarship in the Greco-Roman world. Ptolemy was best known among mundane scholars for his work on astronomy and geography. His Geography surveyed all of the world known to mundane Greek scholars at the time, and his Almagest was one of the most authoritative texts on the stars throughout the ancient and medieval period, providing thorough maps of constellations and tables for the prediction of eclipses. He dabbled in numerous other arts as well, including optics and music. But his most important magical texts focused on the deeper meanings of the stars, beyond simply noting their positions and tracking their movements. In astrology and astromancy, he provided the foundations for modern Magimundi studies in these fields. His writings were translated into Arabic, Latin, Hebrew, and many other languages. He firmly believed in the importance of personal horoscopes: that the circumstances of a person’s life are due in some part to the configuration of the stars and planets at their birth. A person’s talents, temperament, career, even their marriage partner, could be discerned by careful examination of their horoscope. In the course of a well-ordered life, he claimed, a person passed from the influence of one planet to another: for instance, Mercury governed childhood’s changeability and rapid acquisition of knowledge, Venus governed young adulthood with its focus on love and other close relationships; and Saturn governed the quiet stillness of old age. The celestial influences over any individual were therefore so complex that it could be difficult to untangle them all, but an improper calculation could lead to poorly crafted predictions that were at best nonsensical (predicting an imminent marriage for an infant or a strenuous journey for a fragile old person) and at worst so disastrous (financial ruin or premature death) as to cause unnecessary alarm. Therefore, Ptolemy’s approach to divination was nuanced and subtle: he believed that some events are unpredictable; some can be predicted but not stopped; and others can be predicted and changed by human intervention. Even if we cannot change the outcome of events, said Ptolemy, foreknowledge can help us prepare ourselves for what will happen, and to take steps in the areas we can control so that we can bring about the best outcome possible. And, just as a healer learns through long years of study to recognize which ailments can be cured and which cannot, a practitioner of divination can and should learn to recognize which kinds of events can and cannot be changed, so that they can direct their efforts where they can do the most good. Yet he also warned of the danger of focusing too much on predictions for individuals, lest a person miss the potential for disaster in the wider community by never looking beyond themselves. Unfortunately, Ptolemy’s attempt to conceal some of his magical research from mundane eyes led to centuries of misconceptions about the configuration of the solar system. He often wrote on multiple levels at once, using metaphors and magical calculations that only wizards would understand, but that mundane readers would overlook. One such extended metaphor about the earth being at the center of the universe was misunderstood by mundane scholars as a literal description of the cosmos, and magical societies felt no need to correct them. It was not for more than a millennium after Ptolemy’s death that mundane observational techniques caught up enough to reveal the truth. While the geocentric universe was simply a misunderstanding, some of Ptolemy’s other statements truly are wrong, either factually or theoretically, and therefore are no longer followed in either magical or mundane cosmological studies. This can be one of the perils of being first, but there is value in putting theories forward for others to test, improve, or disprove. Some scholars believe that Ptolemy may have traveled in time, as well. He claimed to have access to 900 years worth of written records, which was an extraordinary assertion even for someone working at the Library of Alexandria.